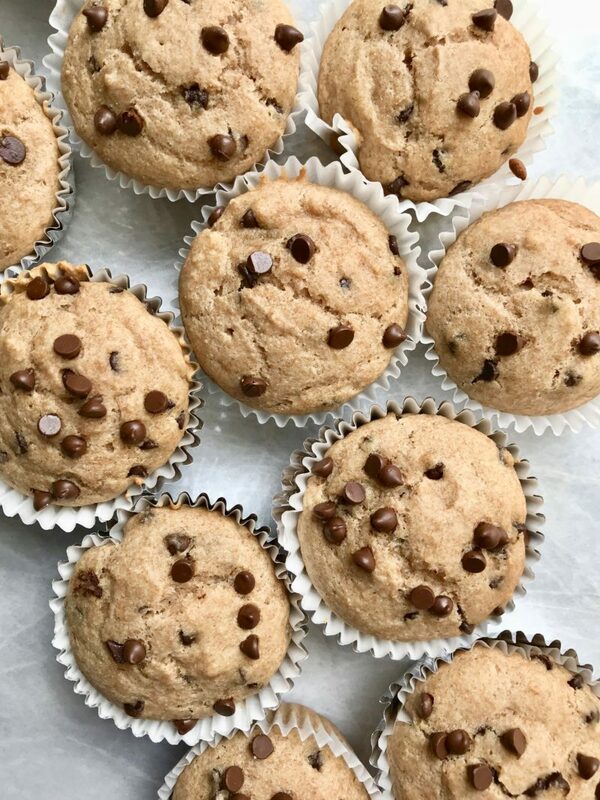 These chocolate chip muffins are super delicious and bakery style inspired. 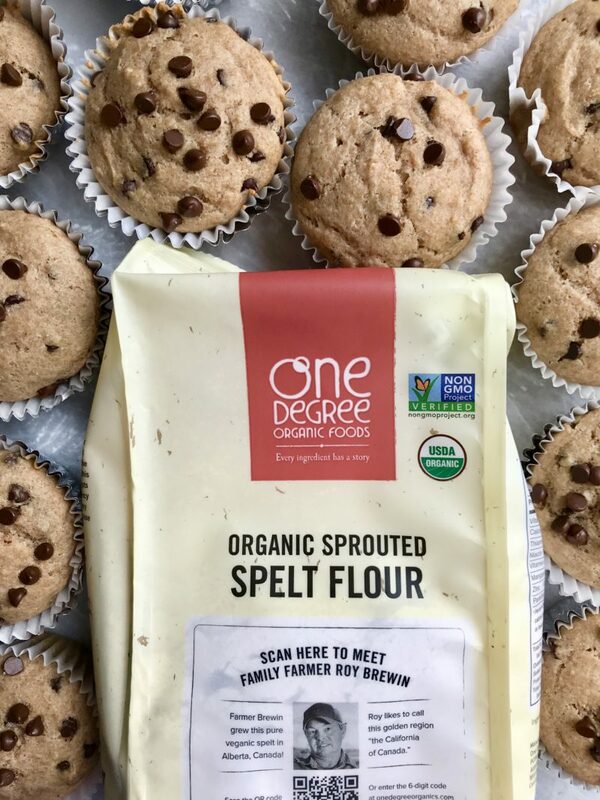 Using spelt flour, these muffins have so much flavor and are completely Vegan. Made in partnership with One Degree Organics. Over the past couple of months I have fallen in love with baking. I’ve always been afraid of baking but lately I have become obsessed. I’ve also loved experimenting with different flours and so far one of my favorites is spelt flour. Spelt flour is a great way to get more whole grain fiber in your diet. 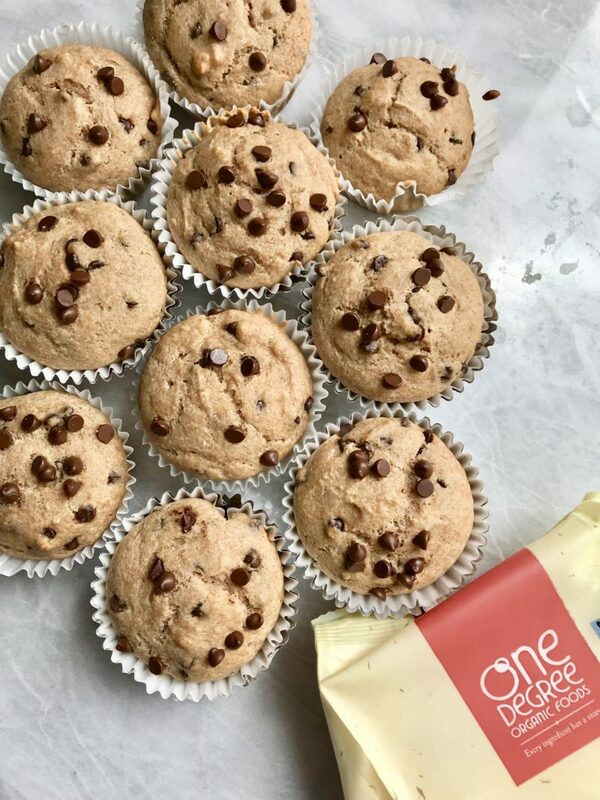 It tastes great and turns out perfectly in pretty much every baking recipe that requires gluten free or all purpose white flour. 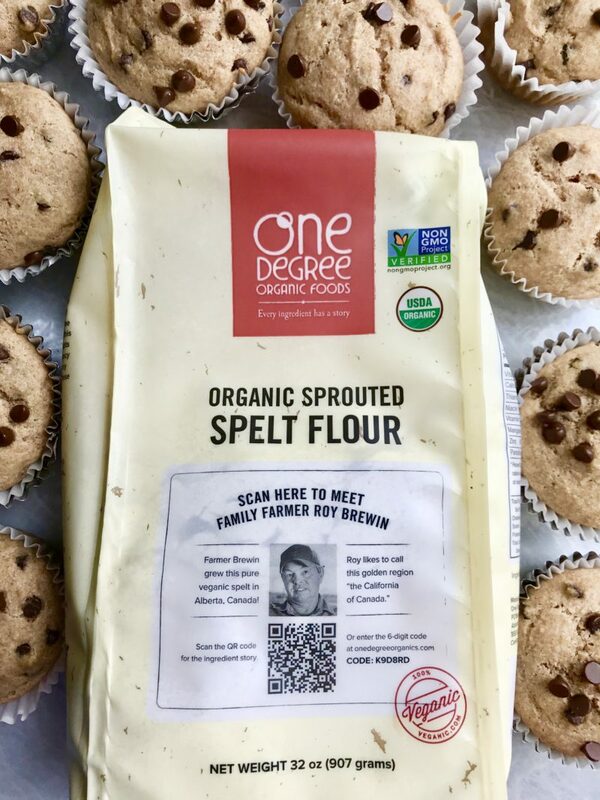 The spelt flour that I use is by One Degree Organics . It’s their Sprouted Organic Spelt Flour. What I absolutely love about One Degree Organics is that you can find exactly where your product came from. As you can see (pictured above) they show that Farmer Brewin grew this Organic Spelt Flour in Alberta, Canada. You can scan the bar code on the package to learn exactly where your product came from OR use the code on the packaging and go to their website and manually look it up. I eat so many of the One Degree Organics products. What initially caught my eye about their products is that their granola is nut free. As someone who is allergic to nuts, finding a nut free but delicious granola is hard to come by. It’s really like hitting the lottery. I also love their cereals, oats, and tortillas. 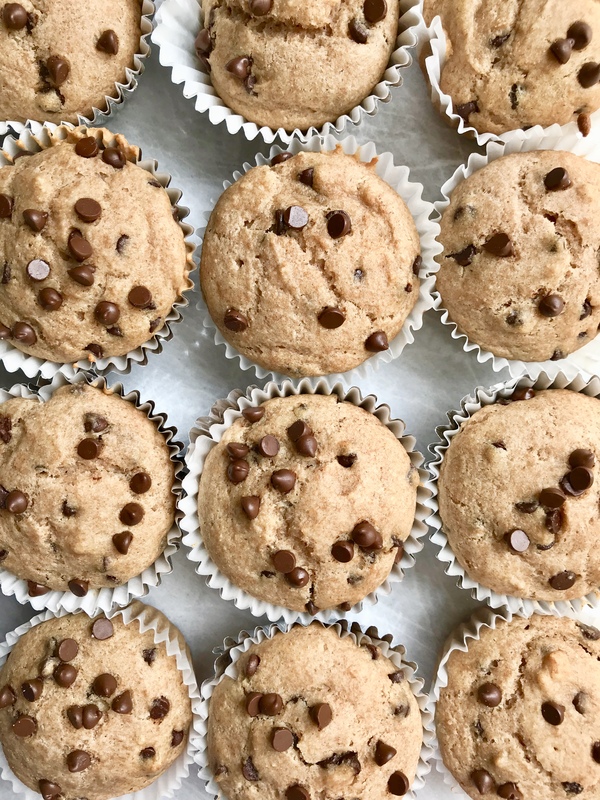 I always love to have a good Vegan muffin recipe on hand. They’re great to serve at a brunch, bring over to a friends house or just make for your family! I really love how these came out and I know that you guys will too! Check out One Degree Organics here. In a bowl, add all of your dry ingredients. Mix to combine. In a separate bowl, combine all of your wet ingredients. Create a well into your dry ingredients and add in your wet. Mix ingredients together until the batter is formed. 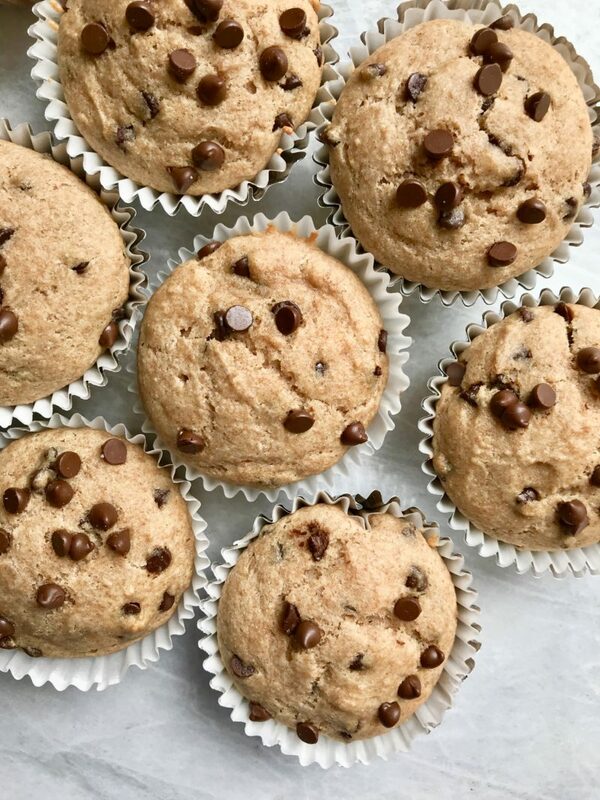 Add in your chocolate chips reserving a couple of tablespoons for topping your muffins. Scoop your batter evenly throughout your muffin tin, leaving around 1/4 space so the muffins can rise while baking. Add your reserved chocolate chips on top. Bake for 25 minutes or until a toothpick inserted into the center of the muffins come out clean. Thank you to One Degree Organics for sponsoring this post. It means a lot to work with brands I love and support my blog!